1. To be familiar with the DNS change request form in the ITS Service Catalog. 2. To either be added to the user’s WordPress instance or able to walk the user through the WordPress Domain Mapping process described below. 4. 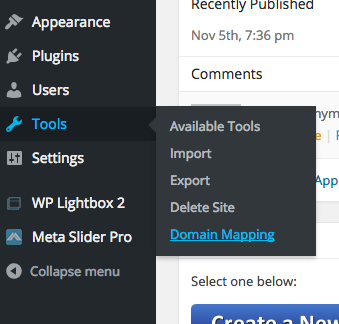 Leave the actions drop down menu to “directed to mapped (primary) domain”. 5. Make sure that privacy settings (Settings > Reading) is set to either “Allow search engines to index this site” or “Discourage search engines from indexing this site” – the site will not function with a cname.ucsc.edu alias if the site is in any way password protected.